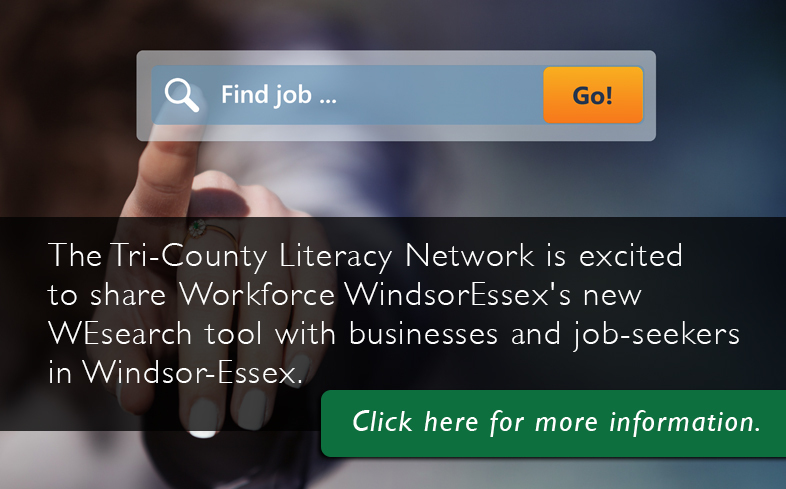 Click here to download the Tri-County Literacy Network Windsor-Essex brochure. What: One to one tutoring. Small group classes (2-8 people). Small group class for Persons with Developmental Disabilities (2-5 people) Help with reading, writing, numeracy and computers.Emphasis on independence and employment readiness. Deaf Literacy program available. Where: Literacy classes are at the Central Library only. Tutoring time and place are convenient to both learner and tutor at any of the 10 branches in the Windsor area. Deaf literacy program located at the Canadian Hearing Society. What: Large group (10 to 40 people). Teacher led instruction. Help with reading, writing, spelling and math. Basic computer. Academic & Career Entrance (ACE) certificate available which is equivalent to grade 12 for the purpose of entering post-secondary college and apprenticeship programs. Assistance with transportation may be available. What: Small group (up to 12 people) instruction. Certified teacher-led instruction. Reading, writing, math and basic computer upgrading is available. Preparation for employment, education, apprenticeship, independence and post-secondary pathways. Help to get your diploma! What: Large group (15 to 20 people). Certified teacher-led instruction. Help with reading, writing, spelling and math. Computer learning programs. Preparation for employment, further education and training. GED prep assistance. When: Daytime – 8:30 to 4:30 with evening hours until 7:30 on Wednesday. Assistance with transportation or day care may be available. What: Certified teacher-led instruction. Small classes (up to 10).One-to-one tutoring. Help with reading, writing, spelling and math. Computer learning programs. Preparation for employment and independence. Childcare and transportation assistance available upon request. Short-term employment related “boutique” training sessions available on a rotating basis. Where: Leamington classes offered at 215 Talbot Street East location. Tutoring provided in various locations at the convenience of learner/tutor. What: Self/Cultural Connections, Community Connections, Educational Development (literacy/essential skills/individualized learning) in keeping with the Ontario Adult Literacy Curriculum Framework. One-to-one and group instruction in reading, writing, math, workforce literacy and basic computer skills. Individual learning plans and flexible hours. What: Small group teacher led instruction. One-to-one tutoring. Help with reading, writing, spelling, mathematics, science and computer learning programs. Preparation for employment. Academic and Career Entrance (ACE) certificate available (equivalent to Grade 12) aiming at entering into post-secondary college and apprenticeship programs. GED preparation. All agencies serve people from the following groups: Adults requiring literacy and numeracy skills, underemployed, unemployed, employment disadvantaged, Ontario Works, Worker’s Safety and Insurance Board recipients. *Large group can be from 10 to 40 students depending on the service provider.